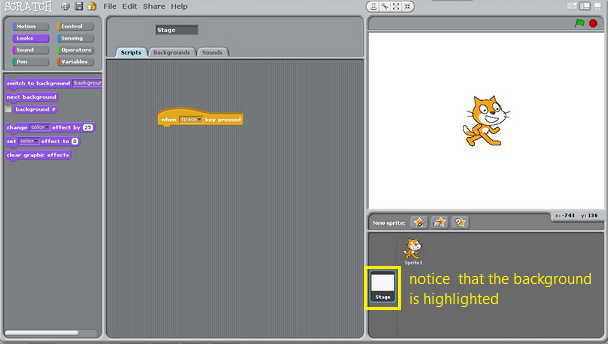 Hope you had read this post "Scratch Programming for Kids - Part 1". 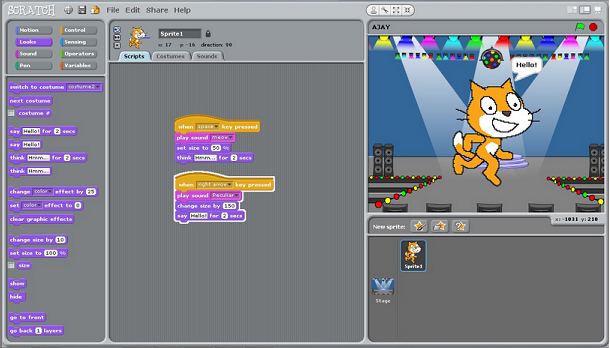 As already told, this scratch programming is the easiest one and will help give kids a very good intro to programming and animations. I also have mentioned in the previous post that after creating a simple program by dragging and dropping blocks of controls, we will be using it along with a special device called "Makey Makey" to bring kids drawings into action. In this post, we will see how to set look (backgrounds, size,etc.) controls to our project. 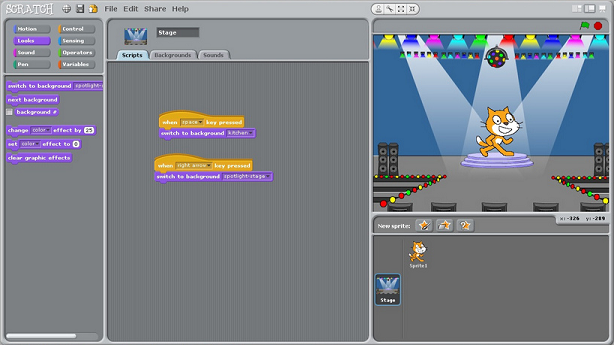 How to add backgrounds to our Scratch project. 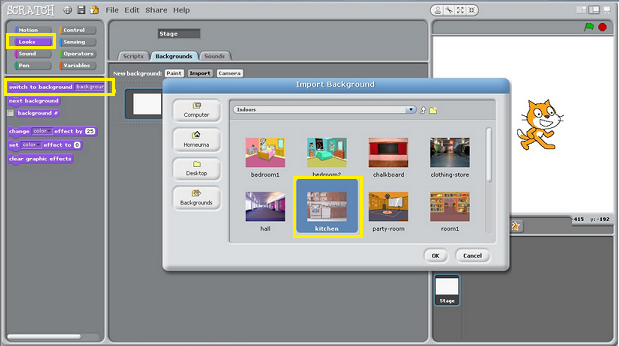 1 - Click and choose the background seen below the stage area so that we can assign background blocks (background images) to it. So now, drag and drop "when (space) key pressed " onto the script area and click on "Looks" button seen on the top left corner of the Scratch. 2 - When the "Looks" button is pressed, you can see that its respective controls gets displayed below. Now, choose "Backgrounds" from the middle panel and click "Import " which will display the "Import Background" box as shown in the image. 3 - Now, drag the "switch to background (kitchen)" to the scripts area where the two buttons snap together as a single code. This will make the stage area switch to the selected background image when the space bar is pressed. 4 - Similarly, repeat the steps for "when (right arrow) key presses" by snapping another background image "switch to background(spotlight stage)"together. Always update the green flag. 5 - Now, I have added more controls choosing "Motion" for making our little kitten to sigh a "hmm" and shrink its size by 50% when "SPACE" key is pressed. You can see that the codes are highlighted and the resultant of the codes can be seen in the stage area. 6 - Following it, when we press the "RIGHT ARROW" key as seen in the highlighted scripts, you can see that the kitten had enlarged in size and says "Hello!". As always update the green flag and save you project. You can try going to the presentation mode and see how your animation goes. With just few clicks, we have assigned sounds to the keyboard buttons, added backgrounds as well as made some actions like speech and size. 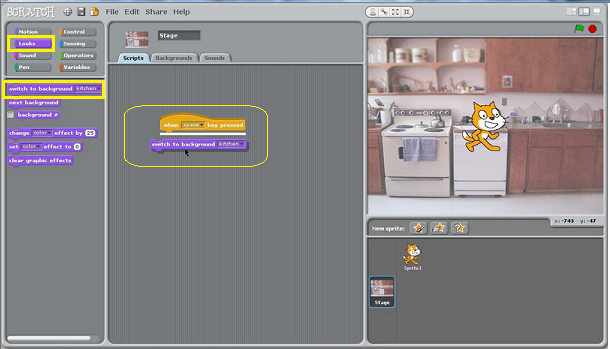 Kids can play with these controls and create simple yet powerful animations with just a click of the button. 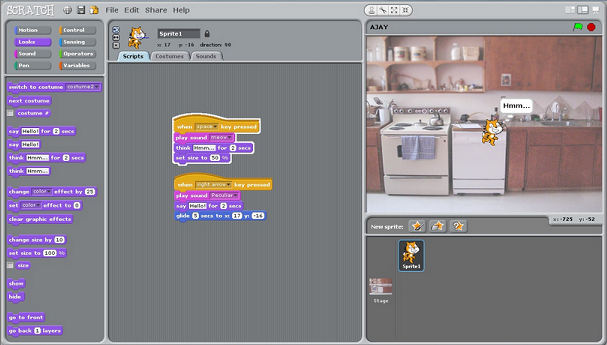 Now head over to "Scratch Programming for Kids and Makey Makey" wherein we will be seeing how to connect our Scratch project to the physical word using Makey Makey.